An in-depth feature length documentary focusing on the human beings behind video games. Pixel Heart will show how the coolest creators from all around the world find their best ideas and how they become awesome games. New games that you’ll be invited to play at the end! Spread the word! Follow us on Twitter, Facebook and Google+ ! Stay tuned on pixelheartproject.com! WHY ANOTHER FILM ABOUT VIDEO GAMES? Far from these clichés, our documentary film will show that artistry and passion are the basis of everything during the whole process of creating a video game. Because Pixel Heart will go further than any movie before to let you experience this whole process : from the very beginning with brilliant creators and how they find their best ideas to the release of awesome news games created during the film ; games for you to play! Because video game creation is not only a North America/Europa/Japan business. There are creators and studios that make awesome games all over the world. Pixel Heart will meet them. From San Francisco to Ghana to Chili, discover how different playing and making games can be depending on their place of birth. Because Pixel Heart won’t tell the story as other documentary films do. You will follow Charles, a young French game creator, in his quest to meet 6 awesome creators all around the globe. His goal? To understand how they find their best ideas, and with their help, to create 12 new games during an incredible game jam. Adventure, tension, emotion, fun, Pixel Heart will be a true epic film! In this documentary, we'll take you through the whole process of creating a video game. Because six of the most brilliant creators are waiting for us! Mark Healey, England, Media Molecule: Black & White, Little Big Planet. Robin Hunicke, USA, Funomena: Les Sims, Journey. Eyram Tawia, Ghana, Leti Arts: Africa’s Legends. Tetsuya Mizuguchi, Japan: Rez, Lumines, Child of Eden. Edmundo Bordeu, Chile, ACE Team: Rock of Ages, Zeno Clash. This won’t be your typical boring series of portraits. Each video game creator will contribute to the creation of the Pixel Heart games with an item specifically created for it. How about music from Tetsuya Mizuguchi? Or a character sketch from Mark Healey? Or something typically Chilean from Edmundo Bordeu? With these six items in hand, Charles will head back to France for the grand finale! The Pixel Heart Game Jam! If you’ve heard of the Global Game Jam or the Ludum Dare, then you know more or less what to expect. We’ll gather a hundred game developers in Paris for 48 hours. They will be split up in 12 teams. You get the idea; each team will create a video game. But wait, there’s more! The basis for these video games will have to be the six items given by our creators! And no cheats, some of them will be there to get their hands dirty! They will be helped by developers among the best in the world, working both on mainstream and indie titles. Many of them are already waiting for it, impatient as they are to take part in a purely creative process, far from what they are used to. We see this Game Jam as a collaborative challenge on top of a competition. This will be a deeply emotional and intense 48-hour sprint. And now, the icing on the cake: you can be part of it! If you feel you have what it takes, feel free to apply by emailing us. Or, you can also earn that through the awesome rewards associated to this project! At the conclusion of this Game Jam, we will have not one, not two, but TWELVE amazing new games! They will be presented during a traveling exhibit. Being crowdfunded is the best way to talk about videogame as it really is, far from any cliché. In the classical broadcast process, the final cut is always in the hands of the producer, the TV channel management crew…In short, it is the one that pays you who decides. With crowdfunding, we want to do exactly the same, except that the one who pays, therefore, the one who decides… is you! Through social networks, FAQ and feedbacks, we’ll always ask for your advice and feedback. That it is you, the backers, that will make the film possible! This Ulule fundraising is capital, it allows us to call upon our main public. Thanks to this first fundraising, we will be able to produce a first version of our project. In any case, you will get all the rewards presented here! Yet, we don’t intend on stopping here! If need be, we will launch a second crowdfunding. Pixel Heart is an international project, so we will then rely on an American platform. Of course, if we reach new highs and surpass our initial goal by collecting the entire budget on Ulule, we’ll bypass the second crowdfunding! The release date is projected for early 2015. You can help us by backing the project, and there are other many ways to help! Give us feedback! Tell us what you think about the project, and what would make our campaign even more successful. Contact us on Twitter, Facebook, or Email. Spread the word! Share this page with your friends and family via Facebook, Twitter, and other social networks. Feel free to recommend our site to blogs, forums, websites, and media outlets such as television and newspapers -- basically, anyone you think might be interested. Exposure is a great way to help us reach our funding goal. Join us! 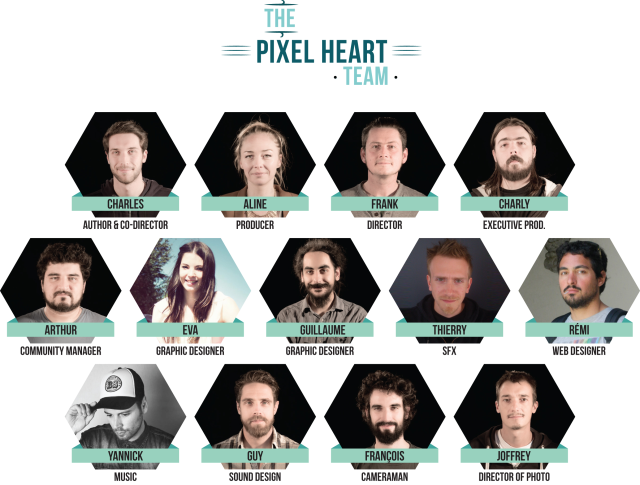 Be part of the team that helps make Pixel Heart a reality; any ideas or talents are more than welcome. Thank you so much for taking the time to help us, now you can pick a reward from our awesome selection! Pixel Heart is a way for me to mix several of my passions, such as video games, writting, music and traveling. 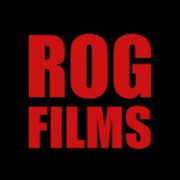 I surrounded myself with a team of talented and passionate professionals: The Rog Films studio. A film director with extensive experience working on complex projects. Spent 10 years travelling the world for scientific and environmental docs, before moving on to fiction. A life-long fan of Fantastique and creation, he is particularly enthusiastic about Pixel Heart’s innovative aspect. A multi-talented producer with experience in PR and event planning. After spending quite some time dedicating herself to promoting young fashion designers in Paris, she has embraced a carrier as a producer in the broadcast industry. Her experience in coordinating complex multiplatform projects is a huge boost to Pixel Heart’s ambition. She hovers over us like a mother hen! Charly is Franck’s brother so, obviously, chemistry is working well here. He is a film director specialized in fiction. He founded Spankidz, an artist collective, after graduating from film school and then went on creating ROG film. Pixel Heart is an opportunity for him to combine his professional field with his passion for video games. For the soundtrack, I will rely on Yannick Bertelli, a singer and composer who performs under the name Tiyan. 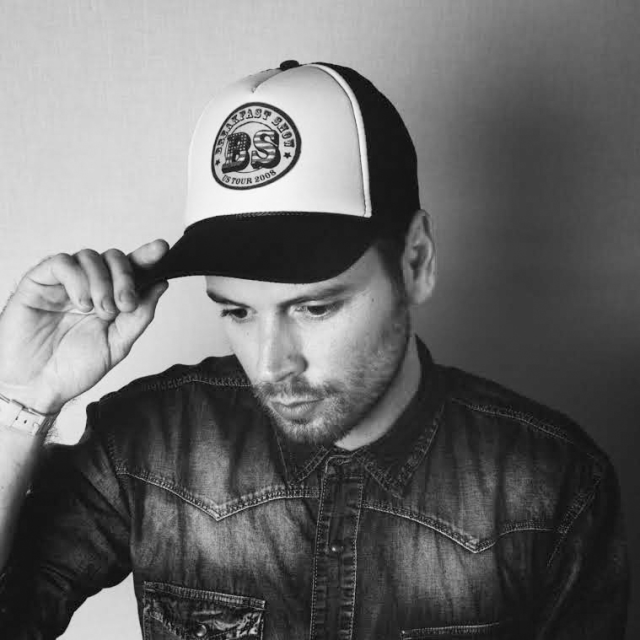 Yannick has experience working in the video game industry, in sound design and music creation. He is also an accomplished singer and songwriter. You can check-out some of his music online and, as a reward for your contribution, you can get his latest EP in the Music Bundle! He will sign the soundtrack of the movie, and as you can hear in the trailer he will use acoustic and electronic instruments. His challenge: to write an original and cinematographic score dedicated to the Pixel Heart project. Crodwfunding is a risky way to finance à project! Do you have other solutions in mind to achieve your goal and find the money needed? Using the crowdfunding is the best way to build the project with you, to stay as close as possible to our future audience. It's a unique and innovative funding solution, and it allows us to be absolutly free in terms of content. But yes, it's also a very risky system. That's why we're also preparing public and private financing cases, and are still looking for investors and partners (especially for the Game Jam and the exhibit). We think about launching a Kickstarter in the next few months in order to reach a more worldwide audience. What do you mean by "digital distribution"? The digital distribution will be the best way to access to Pixel Heart (both games and film). It gives the viewer/the player an entire freedom of use (DRM free). For example, we think about a "Pay what you want" system (like Humble Bundle) to let everyone choose how much money to spend to buy Pixel Heart. Of couse we'll also propose you to get the film as a DVD or a Blu-ray, and in this case you'll be also rewarded with the digital version of the movie & games. It seems you already have a Producer (Aline) and an Executive Producer (Charly)… Why are you still looking for money?! A producer in the cinema industry (and video games industry) is not the one who has the money, he's the one who do his best to find some! Aline'role is to organize the production, manage the team and find ways to finance the project with investors, partners and so on. What are the main differences between Pixel Heart and Indie Game, The Movie? Being compared with Indie Game The Movie is great, it's an amazing film. However Pixel Heart is different for several reasons. - The games. PH is not only a movie, we want to move from theory to practice by proposing 12 playable games at the end of the adventure! - The cultures. Contrary to the IGTM approach wich is focus on US developers, we want to show people making games in 6 different countries around the world. To speak about their culture, their differences, and so on. - One world. We don't want to split the gaming world into the "indie" and the "mainstream" world as IGTM did. We want to find creativity wherever it is. - IGTM often sounds very serious, almost dark, and we want to bring some fun and some light into the darkness :). Showing 6 warm and joyful people, creating games with passion. - The road-trip : Pixel Heart will be a real treasure hunt all around the globe, you (and we!) will have lot of surprises during our journey! - The documentary website. It will complete the film with a non-linear experience, giving you tons of details about our trip, the creators and the jam. If you achieve the Ulule, will you be able to produce the whole project? 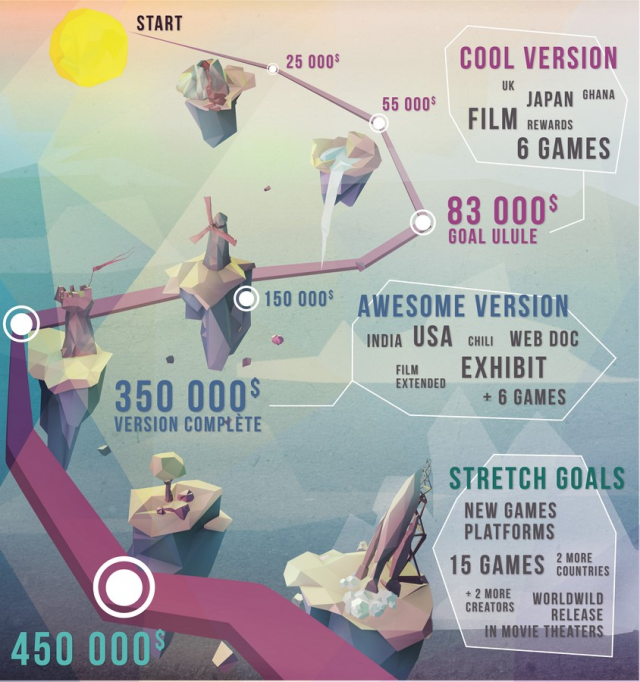 If we reach 60 000€ (about $ 83,000) we will be able to produce a first version of our project, featuring at least 3 creator & countries in the movie, the Game Jam and at least 6 games. In any case, you will get all the rewards you paid for, starting with the film and the games! 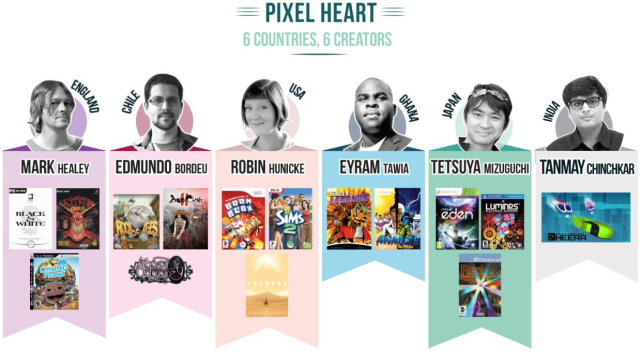 You told us Pixel Heart will feature 6 creators, but where is the Indian one? We're still investigating to find the best candidate in India. Our surprise guest will walk us through the challenges facing an established creator working on home-grown projects; as India is now the leading outsource destination for western companies. We will announce his name asap! Is it possible to develop games in only 48 hours? Sure! Of course we're not speaking about creating the next COD or GTA, but about innovative and fun games! Lot of studios use to prototype new concepts during their own Jams (Bioware, Thatgamecompany). Trust us: it's an unique opportunity for you to play awesome concepts, totally different from what you're used to play. Where will the Gam Jam take place? Can I take part of it? The Game Jam will take place in Paris, France. And yes, you can be part of it! Feel free to apply by emailing us at [email protected] (send us some details about you and your skills in this case!). 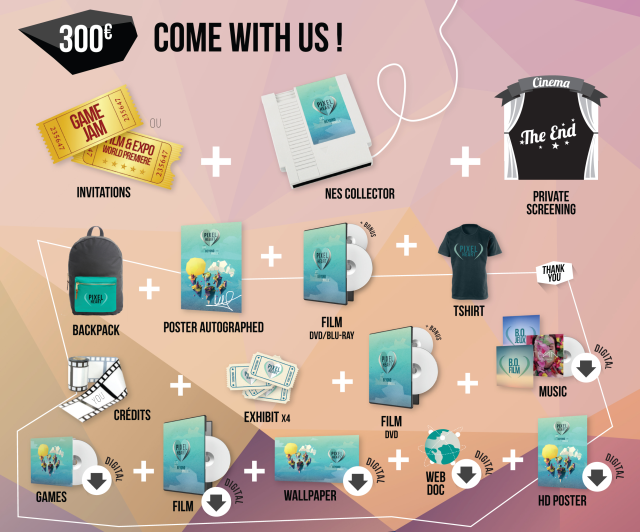 Or, you can also participate by backing us on Ulule, check out some of the most awesome rewards! In the reward section, it's sometimes written "+ rewards listed above (DVD or Blu-Ray)". What does it mean? Is the Pixel Heart movie supposed to be shot in english? Absolutely! Our 6 creators will speak in english (and Charles too). During the Jam, if some developers speak in French we'll put English subtitles in the movie of course. Where will the exhibit take place? As a first step, the exhibit will be presented in France. Then -depending on the funds we'll raise!- we'll come to the Us and, we hope, in some more countries to present all the 12 games and our complete journey! Why did you choose Ulule instead of going on Kickstarter? For a non-american company, launching a project on Kickstarter is relatively expensive. You can't do it from France, so you have to find a company able to help you abroad, or build your own company in the US. In both cases it was way too expensive for us right now. Also, starting a Kickstarter without having a strong community is very risky, and that's why going on Ulule first is a good way to build this audience (ready then to follow us on KS if we need one during the production). Lastly, most of the movies/games asking for money on KS are almost done and ready to be released: games have demo, films have trailers, etc. Pixel Heart is for now in its pre-production phases, so we'll get back on KS (if needed) once the shooting have started. Anyway keep in mind that if Ulule is easier for us to use, it's the same for you! You can access it from abroad, wherever you are, and support a project using the same means of payment than Kickstarter! Thanks for the helping hand! Your name will be listed on our website & on the Facebook page + you'll get the project's wallpaper. Download the movie in HD as soon as it's released! A pack including the movie + all the downloadable games as soon as Pixel Heart is released ! DVD of the movie + exclusive bonuses! Movie with audio commentary + additional sequences! + the Pixel Heart T-shirt! Blu-Ray of the movie + exclusive bonuses! Movie with audio commentary + additional sequences! The Pixel Heart poster autographed by the crew ! + your name in the movie credits! + 2 more tickets for the exhibit (= 4 total)! A Pixel Heart backpack so you can explore the world! Invitation to our Game Jam closing + Private screening + NES ! Enjoy the final moments of the Game Jam with us, discover the new games before everybody else and meet the teams! + Private screening: you'll discover the film before the release with the whole team! + the collector Pixel Heart hardrive! A real ultra-limited edition NES cartridge turned into a hardrive (with all the digital content)! Get a feel of Mark Healey's universe: his autographed games & collector items from his universe and country! Get a feel of Edmundo Bordeu's universe: his autographed games & collector items from his universe and country! Get a feel of Eyram Tawia's universe: his autographed games & collector items from his universe and country! Get a feel of Robin Hunicke's universe: her autographed games & collector items from her universe and country! Get a feel of Testuya Mizuguchi's universe: his autographed games & collector items from his universe and country! Get a feel of our Indian guest's universe: his autographed games & collector items from his universe and country! You are inside Pixel Heart! A 30-second video of your choice will be added to our website in a special section! You wish to show your pretty face to the world or a some of your creations? Now is the time! You'll be added to one of the teams for the full 48 hours and will take part in the creation of a video game! A unique pack to live through our journey time and again: you will get all the country packs (England, Chili, Africa, Japan, USA, India) with all the unique items autographed by the creators! Be a contestant in the Game Jam + your item or avatar ! You'll be added to one of the teams for the full 48 hours and will take part in the creation of a video game! But most of all, the item of your choice or your own avatar will be used in the game by your team! > You'll be listed as an Associate Producer in the movie credits and on IMDB! > You will get regular individualized updates on the project and frequent email & skype contact with the team. > Take part in the Game Jam with the film crew! You will live every second of it with us! > You will be listed as an Executive Producer in the movie credits, on IMDB and the movie poster! > To thank you for your TREMENDOUS support, you will get individualized updates about the project: meetings in Paris during the setup and the filming sessions + emails & Skype! > You'll be on stage for the world premiere of the movie and will be involved in all the production details! > You will have your own screening of the movie before the editing is over so we can take into account your feedback! A last chance to make Pixel Heart comes to life: fund the project to launch the production! We'll discuss about everything if you're interested, but keep in mind that your awesome investment will grant you a unique place on the project. Whether it's a co-production, sponsorship or even donation we're open to discuss, and you'll be taken care of. Time is running out: if you want to make a dream comes true please contact us!